Somehow I have the feeling that ING Direct has lost its luster as the leader of online banking, the position that it held for several years before everybody in the banking industry started to offer “direct” banking with similar products. My reason is the rates of their Orange Savings Account have consistently fallen behind its major competitors. Currently at 4.50% APY, you can easily find a dozen online banks, big and small, that pay savers 5+% APY for their money. If you are a rate-chaser like I am, you probably don’t find ING’s savings products appealing as they used to be. I almost emptied my ING account last year after I found many better places to park my money, despite having been their customer for more than 5 years. So is ING Direct seeing its customer basis shrinking? ING Direct has more than 5 million account holders, with 100,000 to 150,000 more signing up each month. 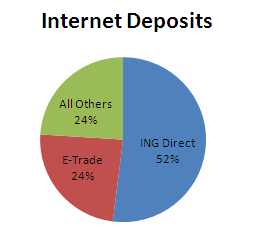 So far, ING Direct still holds the largest share of internet deposits in the US and the pure online bank “ranks 24th among U.S. banks when measured by total deposits,” just behind regional bank Sovereign Bancorp. When customers call the toll-free number, a person – an actual person in Los Angeles, Minnesota or Delaware, not an automated menu, not an operator halfway around the world – picks up the phone. This may be true, but when I just called to test it, I was greeted by a recorded message and was told there are 15 people ahead of me (they probably need to heir more people). In addition, the article also mentioned that the introduction of ING’s paperless checking account last year was to fend off competitions from rivals. However, there are still demands for paper checks and what ING is doing now is print and mail about 25,000 paper checks every month without any charge for postage (I know BoA also sends out paper checks for their online billpay service if the fund can’t be delivered electronically, but maybe at a smaller scale). To me, however, customer service doesn’t play a decisive role in choosing an online bank. What matters the most is rate. If their rate is not competitive, I don’t see myself going back to ING Direct no matter how good their customer service is. Hello. Thank you for this good post. I came up with a somewhat long list to explain ING’s share so I posted the list as an article (click name link). Thank you. This is dumb of me, but I like ING because I pass their corporate offices on I-95 when I drive through Delaware. I find it reassuring they have an Orange cafe in Philly. Though I have no need to visit their physical locations for any reason, I am disturbed that I can’t see an HSBC anywhere I go. I can’t be bothered to chase returns like you do, but to each their own. I don’t keep around a lot of cash and so far, the electric orange account hasn’t screwed me over. But I am a late adopter of it since I still like having a local brick and mortar bank. (Yes, I also still get paper statements too.) And I will probably never fully get away from a real bank. I am purely a “rate-hugger” and don’t have an account at ING. If you were a bank and you had 52% of all internet customers and noncompetitive rates that weren’t drivign people away, what would you do? If it were me, I’d drop the rate to 4.25 and see how many people are retained. According to the article, they had $47 billon in deposits in 2005. So, lets assume its up to $50 billion now. Dropping the rate now to 4.25% would increase their annual income by $125 million. And I doubt they would lose that many people in the process. Mapgirl: To me, I have only one need from the online banks and that’s good rates. Yes, I also have a B&M bank and I don’t think I will ever get ride of it (I like the convenience of making a quick deposit and getting cash whenever I need it and these can’t be replaced by a bank that does its business only online, but I am trying to eliminate all paper statement). In fact, having a B&M bank allows me to open me a lot online bank accounts and move money among them depending on who gives the best rate. What’s the purpose of having an online bank if it’s not for their rate? broknowrchlatr: The article says ING has an annual defection rate of 3% and that’s a relatively small number. However, I do feel that if their rate is a full percentage point less than what others are offering, more people could move their money away without closing the account. I still have the account, but only have $50 in it. 1) It works well for me. 3) I can move my working money from checking to savings with ease while still gaining interest on my checking. I’m willing to lose a little interest with money in checking for the usability that suits my financial practices (though a large portion of my money is in a higher interest account at another bank, and other than adding funds, I do not touch). 4) Sub-accounts! I love the sub-account functionality. 5) Customer service is important to me. Though I am low maintenance, I have had good experiences the few times I have called. In my book good customer service is a reflection of the company as a whole. web hacking, phishing, etc. that’s growing at rapid rate, security will play an important role in my deciding for an online banking. i like to chase rates but i don’t want to give my social security number just easily. When I read the article, the most interesting part that jumped out was the fact that ING realizes that not every customer is “right” for what they offer. Quality, not quantity, in action. I did the same thing emptying out ING in favor of Igobank. ING is helped because of the signup bonuses, and the fact it has done some good marketing. what troubles me about ING is the CEO’s “knock your self out” comment. indifference from a company with your money is not a good sign for me nor does it give me confidence in the company. i have to wonder about the signup rates and defection rates posted; however, I agree that there are probably more defections in terms of moving money out to get higher rates, rather than complete closure of accounts. ING has been my fall back account, but I think I’m just going to close it now. it doesn’t make sense for me to keep minimum in that account since I get the a better rate out of my MMA, which I can use as a fallback account to Igobanking. personally i consider customer service to be the most important part of any ebank. After all if you are going to trust 3-15k of liquid cash in an institution you cant visit it makes sense that quality customer care should be a priority. I am an Etrade, Igobanking and ING customer and the few times that I have called Etrade and Igobankinig the customer service was obviously being staffed outside of the US and the quality of help was poor. To their credit ING can afford to do this because their website is simple and the whole process is very streamlined. So in summary while ING cant please all rate chasers for the majority of America that just wants to bank simple it works fine. ratechaser, i’ve had the exact opposite experience with Igobank. my CSR’s sounded like little old ladies in white tennis shoes to me. i had a small issue opening the account, but ever since then, i have had no problems. maybe it will be different if i ever have to call them again. BTW, just because they have an accent doesn’t mean it is being staffed outside the US. don’t get me wrong, I like ING. i’m just not nuts over their indifference.